To make the salad, place the capsicum in a baking dish. Drizzle with 2 tsp of the oil and smear to coat. Roast for 10 minutes (30–40 minutes if using a regular capsicum), or until skin is blistered and flesh is soft. Transfer to a bowl and cover with plastic wrap. Once cool enough to handle, peel, cut into 1 cm dice and place in a large bowl. Add the remaining olive oil, the lemon, celery and leaves, parsley, garlic, olives, chilli flakes and salt. Stir well and set aside. 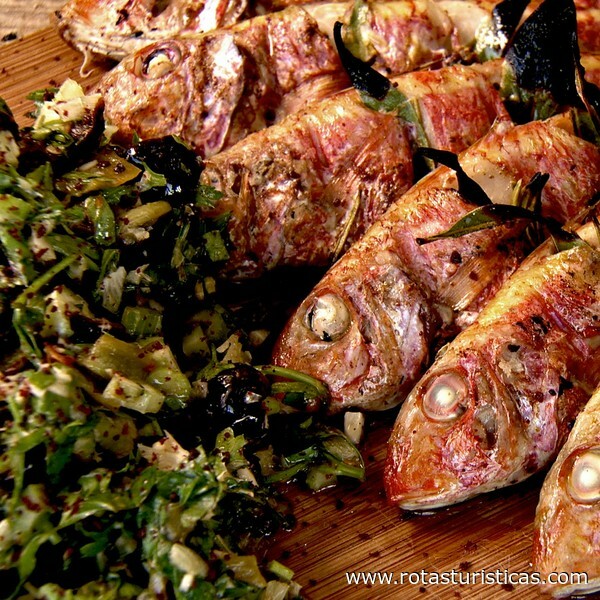 Score the red mullet 2–3 times on each side in parallel lines at a 45 degree angle to the fish. Slice the bay leaves into fine strips and stuff into the incisions, followed by each of the other herbs. Place the fish on a baking tray lined with baking paper. In a small bowl, mix together the cumin, olive oil and salt. Drizzle or brush this over the fish. Preheat a grill on high. Once hot, place fish underneath and cook for about 6 minutes on each side, or until flesh is firm and cooked through. Serve the fish with the salad on the side, dusting the salad with sumac as you serve.